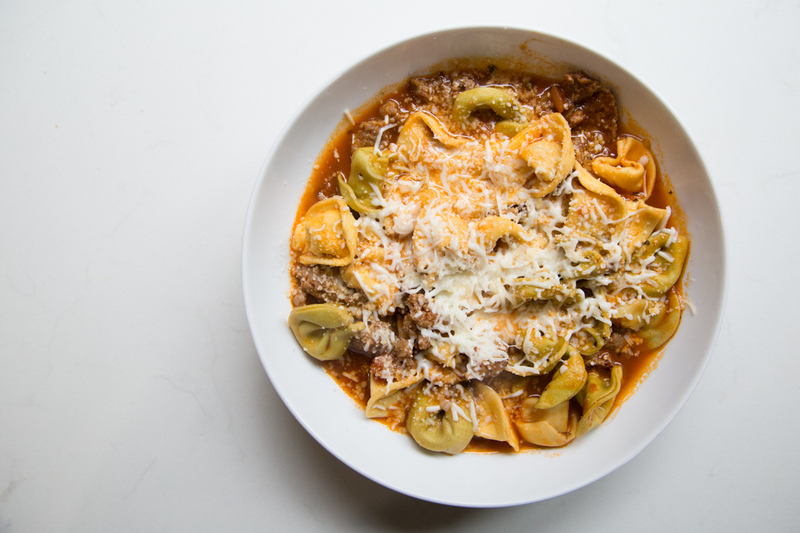 This tortellini is especially fabulous, not only for it’s depth of flavor, but also because it cooks in the slow cooker. This isn’t the kind of meal you can put into the slow cooker in the morning and come home to after a busy day. This is the kind of slow cooker meal that you start 1 hour before dinner. And you go about your afternoon…helping with homework, looking for lost soccer cleats, signing kid’s up for the next sports season or with new music teacher, or whatever you need to do in the afternoon hours. Then, you’ll hear the BEEEEEEEP signaling that the slow cooker is finished and DINNER IS READY. Hope you enjoy this, as much as I do! In a skillet, brown the ground Italian sausage then drain. Place the browned Italian sausage into the base of the slow cooker and add the tortellini (fresh or frozen), marinara, beef stock, salt, pepper, and Italian seasoning. Gently stir through. Set the slow cooker on low and cook for 1 hour. At the end of the cooking cycle, stir the grated Parmesan cheese into the sauce, and then top with shredded mozzarella cheese. Serve Slow Cooker Italian Tortellini with side salad.